Some major manufacturers are no longer making their boots in America, so we set out to find the best cowboy boots still made in the USA. Below is our research, including our top recommendations, tons of details about each one, and the factors we considered in our research and testing. While searching for the very best cowboy boots that America has to offer, we looked at tons of different companies – we found 4 that really stand above the rest. Our top choices include companies like Caboots and Lucchese, who both offer top-level customization options and go the extra mile to offer the absolute best quality product to their customers. We broke down different boot options based on their type and what they were best for. Overall, we were really impressed by the high quality boots that you can still get made in America. Below are deeper details on each of our top picks – tons of details about each one, what we liked, what we didn’t like, and more. Abilene is one of the few larger American cowboy boot companies still around today, and has been producing quality boots for more than 30 years. The company offers a few different lines of boots, but all offer top-quality leather with reliable construction. We love that the boots from Abilene are made with full-grain leather that’s thick, tough, and built to last when cared for properly. These Abilene boots feature rubber or composite outsoles for maximum gripping power and they are cushioned within for comfort. The boots also often feature a Dri-Lex internal liner to keep your feet dry and comfortable during use – great for when you’re working outdoors. They’re impressive boots, sized to fit well, built to last, and styled to stand out. 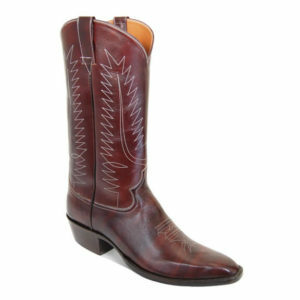 If you’re searching for the perfect fitting cowboy boots, Caboots is a company worth checking out. Caboots, or Champion Altitude Boots, is a family-owned company that’s been operating since 1928. 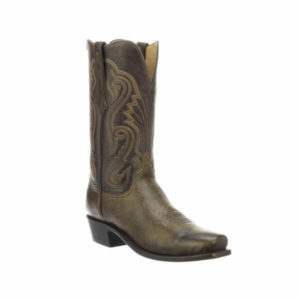 They offer durable, handmade boots that are custom fitted and designed to meet exact standards. We love just how many different customization options are available on the different boots from Caboots. Though the different Caboots offerings aren’t made with the same material every time, we are impressed with the quality level in most of their selection. Most of the Caboots lineup is made with mulehide and built to withstand many years of heavy use. When purchasing boots through Caboots you’ll need to specify the: width, height, toe size, heel size, scallop type, sole type, top color, vamp type, and more. In the end, you’ll end up with a pair of boots that are handcrafted to your exact specifications. With all that customization comes a cost – they’re very expensive and should be purchased with care to make sure you get the best value for your money. Finding tough and reliable handmade boots isn’t a simple task, but Lucchese Boots stand up to tough scrutiny. 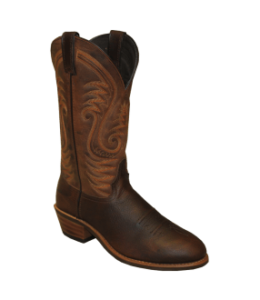 These boots are made from a range of exotic materials, as well as standard cow leather. It’s possible to get alligator boots, lizard boots, and a range of different leathers when buying through Lucchese. All of the boots offered are handmade and go through a careful process to maintain the highest level of strength and durability at the end of the build. We like that these Lucchese boots all pretty much rely on a durable single-stitch welt construction for tough quality and easy maintenance. The boots hold together very well, and can be resoled in the future if necessary. We love that Lucchese relies on old-fashioned construction tools such as lemonwood pegs for long-lasting strength that more modern boots don’t offer. They aren’t cheap boots by any means, but if you are looking for some of the highest quality cowboy boots, Lucchese boots are worth the money when chosen with care. These Orvis Oil Tanned roper boots are some of the softest leather boots we’ve ever tested. The boots are made from full-grain leather and they’re built for maximum durability. Each boot features a rubber outsole that’s flexible while offering excellent gripping power, making them capable on most surfaces. These boots look really nice, but we’re most impressed with how soft and comfortable they are. While these boots are a bit difficult to put on since they don’t have a liner and aren’t perfectly smooth within, they are supremely comfortable and will hold together for a long time. If you’re searching for a quality cowboy boot that’s made in America and designed for maximum comfort, this is the option for you. The boot is sold in whole and half sizes and offers a good fit for most when sized properly. Sadly, not all of the brands under Justin Boots are made in the USA. We dug in to find out exactly which ones are and are not, and outlined our findings in this guide. Great boots aren’t just tough, they’re also super comfortable. For some pairs, there is a break-in period before they are truly comfortable, but in the end our recommendations should be very comfortable to wear. Comfort in boots is typically achieved through arch support, internal lining, and sole cushioning. These simple enhancements make boots more enjoyable to wear over time. Even a boot made from the toughest materials can fail if it isn’t held together with a durable construction process. That’s why we look closely at what’s holding the sole of a boot on, and what sort of stitching is holding the different sections of a boot together. Quality boots rely on thick stitching and reliable sale fastening methods such as the Goodyear Welt to hold the sole firmly in position (and to make it possible to resole the boot in the future). If you’re going to get some new boots, make sure to look for some jeans made in the USA as well. 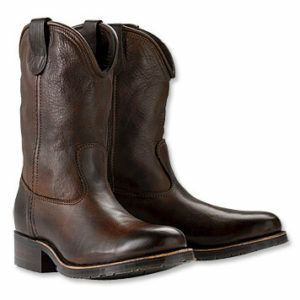 Cowboy boots are known for having a higher heel than most traditional boots do. This is to lock into the stirrup more reliably when you’re riding a horse, but it also serves as a benefit to shorter people that want to add a bit of height. Most boots are between .5 and 2 inches tall, and the size that you choose depends on what you want to achieve. If you’ll be using your boots for serious horseback riding, you’ll want to go for at least one inch of heel height. If you’re just using them for style and want something comfortable to walk in, a half inch heel will work just fine for you. If you’re trying to make yourself a bit taller, you can go all the way up to a two inch heel without looking out of the ordinary with a good pair of boots.